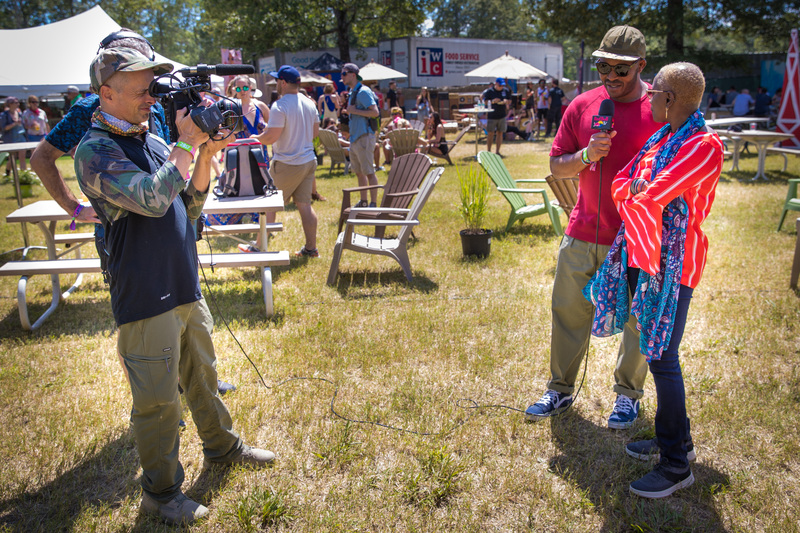 Angelique Kidjo is interviewed by Sal Masekela at Bonnaroo Music & Arts Festival in Manchester, TN, USA on June 9, 2017. 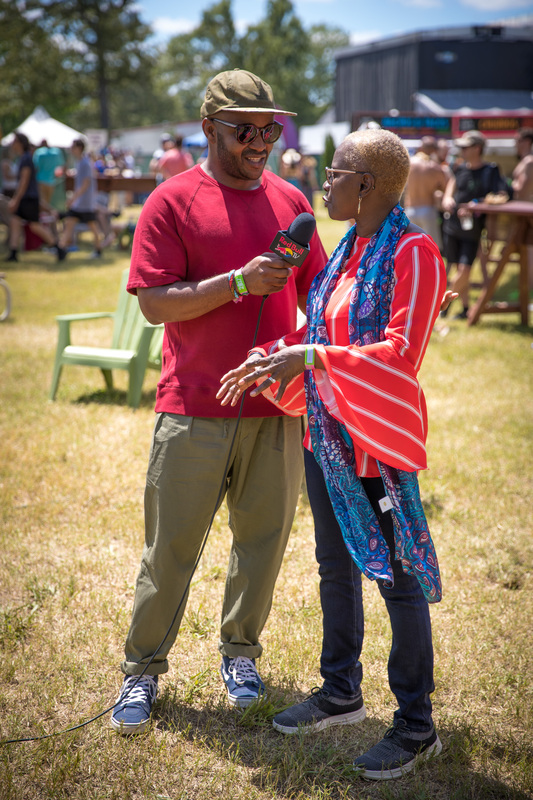 We arrived on site for day two of Bonnaroo around 1:00pm, and I started by shooting an interview with singer/songwriter and activist Angelique Kidjo and Red Bull’s Sal Masekela. When photographing interviews like this, my goal is to capture shots that show both the production involved in case the client has a need for it, as well as just photos of the interviewer/interviewee. Depending on the space I have to move around, I’ll use some mix of the 24-70mm f/2.8 and 70-200mm f/2.8 lenses. From there, I went back to the Red Bull trailer to do a quick edit and check in with my editor before heading out for my first performance shoot of the day at What Stage (the main stage). Since this was the first day of performances on the main stage, I arrived at the early to make sure I familiarized myself with the entry points and introduce myself to security. The stage had a thrust in the middle (, and I found out that most of the photographers would be stationed on one side of it. I made my way to the opposite side, because who wants to get the same shots everyone else is getting? Francis & The Lights performs at Bonnaroo Music & Arts Festival in Manchester, TN, USA on June 9, 2017. 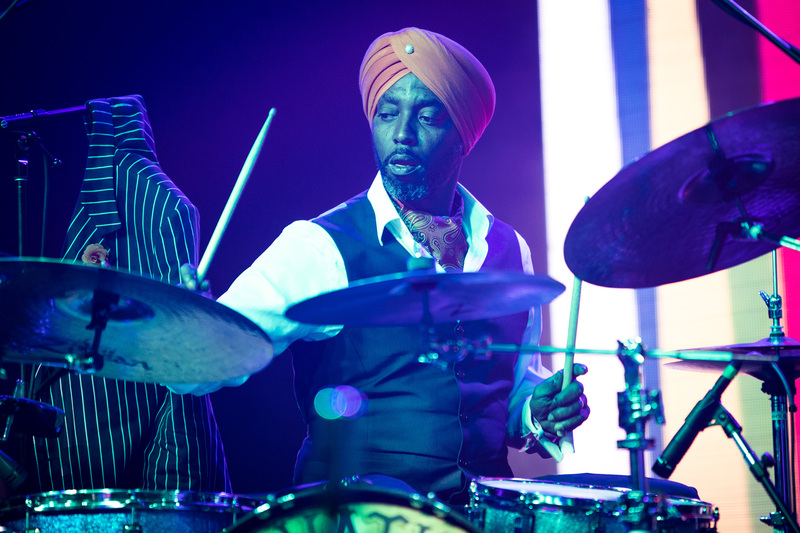 Francis & The Lights, of which Francis Farewell Starlite is the sole member, took the stage with a highly energized set. 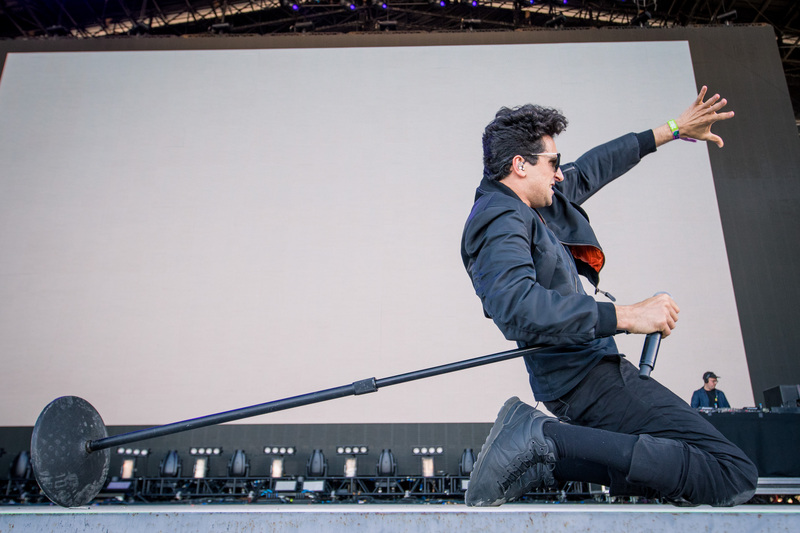 As the first act of the day on this stage, he really woke up the crowd with his performance. 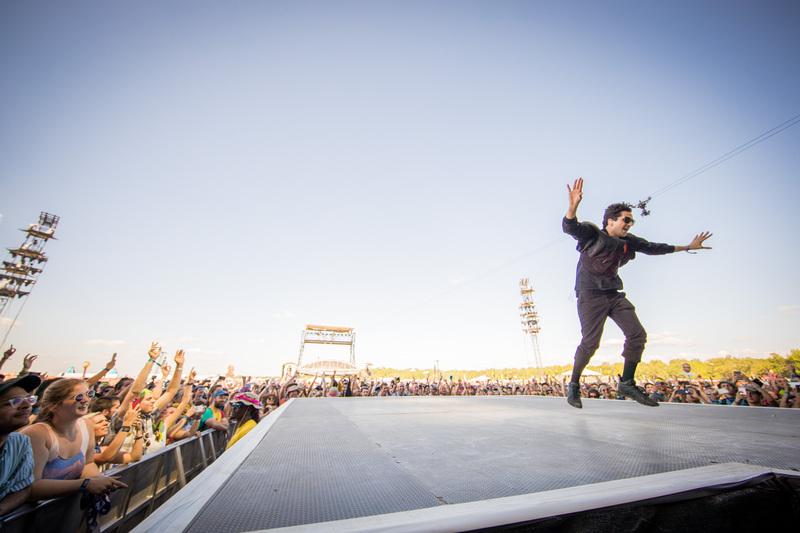 I mostly relied on the 11-24 mm f/4 as my wide lens for his set. Chance The Rapper looks on as Francis & The Lights performs at Bonnaroo Music & Arts Festival in Manchester, TN, USA on June 9, 2017. Part way through the second song, I heard someone say, “Oh, there’s Chance!” I pull back from my camera and look up in the stage side balcony, and sure enough, there’s Chance The Rapper looking on in support of his collaborative partner. Even though I was right at the stage, he was still a good distance away from me, so I used the 70-200mm f/2.8 for this shot. I finished shooting Francis, then made my way to my next shoot. Nathan Willett of Cold War Kids performs at Bonnaroo Music & Arts Festival in Manchester, TN, USA on June 9, 2017. This was my first time seeing or shooting Cold War Kids, and they didn’t disappoint. The only downside of shooting daytime outdoor performances is that the stage lighting doesn’t have much effect on photos. It’s pretty much all white/warm light from the sun. 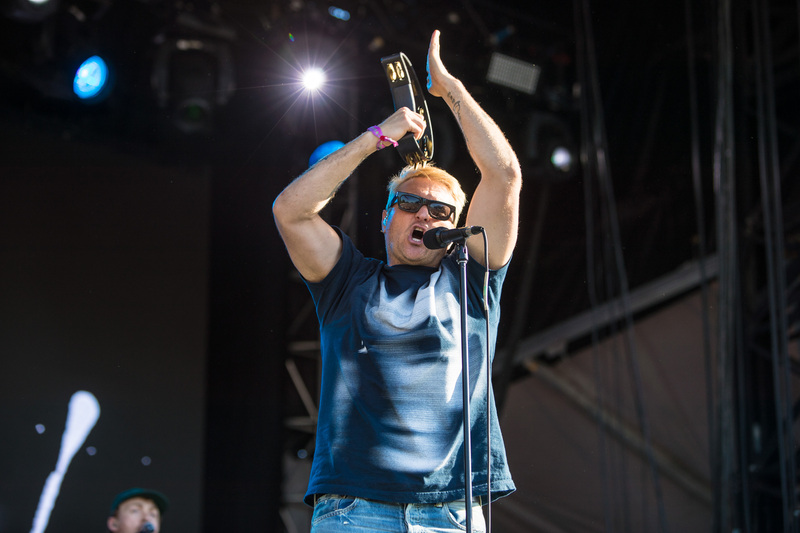 Thankfully, lead singer Nathan Willett is an energetic performer and gave the photographers plenty to work with. Brad Shultz of Cage The Elephant hangs with friends at Bonnaroo Music & Arts Festival in Manchester, TN, USA on June 9, 2017. 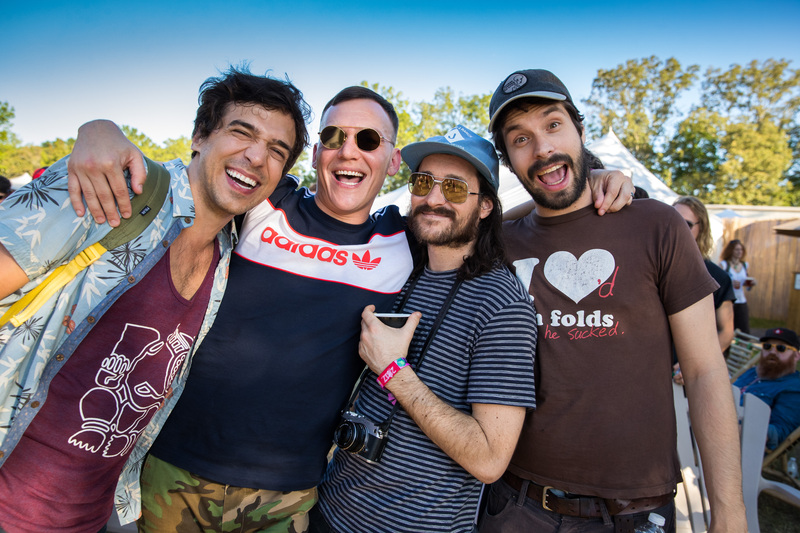 After shooting Cold War Kids, I went into the artist hospitality area where various vendors are set up (as well as Danny Clinch and his backstage artist portrait area) in hopes of getting candid photos of artists hanging out. Brad Shultz from Cage The Elephant and his friends were more than happy to pose for a shot! I didn’t want to be right up in their faces, so I shot this on the 24-70mm f/2.8 in order to be wide enough to fit all of them in the frame without being right up in their faces. 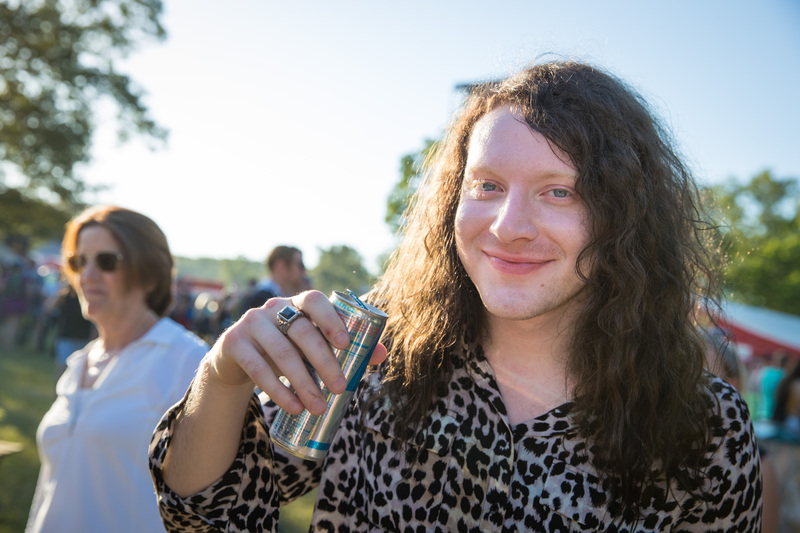 Mario Cuomo of The Orwells enjoys a Red Bull at Bonnaroo Music & Arts Festival in Manchester, TN, USA on June 9, 2017. Mario Cuomo from The Orwells also gladly posed for a shot, and gladly drank some Red Bull for his photo. Portugal. 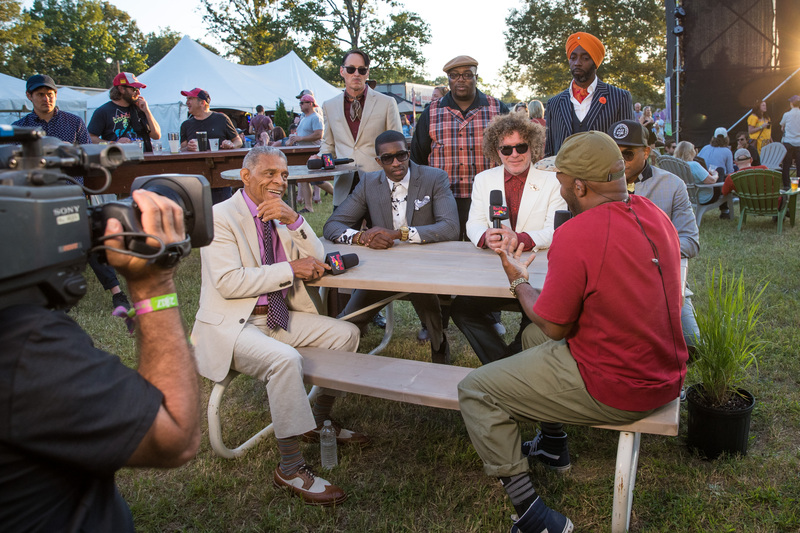 The Man is interviewed by Sal Masekela at Bonnaroo Music & Arts Festival in Manchester, TN, USA on June 9, 2017. After getting a couple of candid shots, I turned the corner to Sal’s World, where he was interviewing Portugal. The Man. 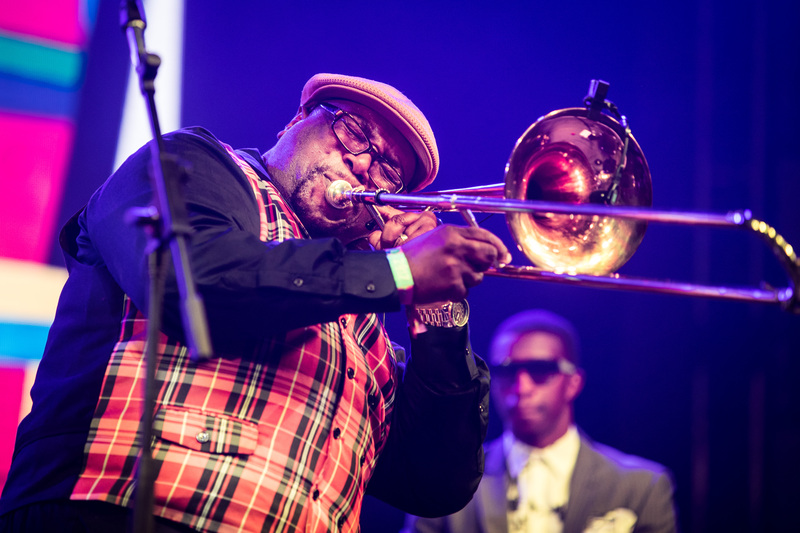 Preservation Hall Jazz Band is interviewed by Sal Masekela at Bonnaroo Music & Arts Festival in Manchester, TN, USA on June 9, 2017. Then I followed Sal out to this picnic table where he was joined by the legendary Preservation Hall Jazz Band for an interview! 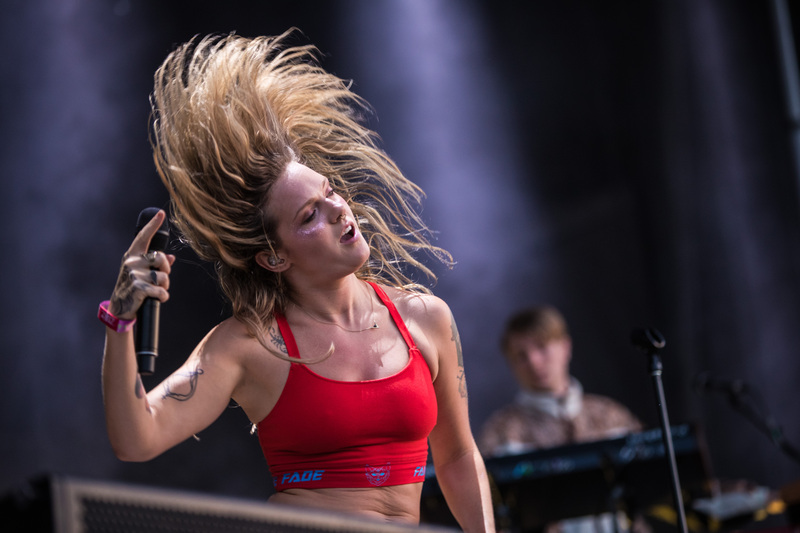 Tove Lo performs at Bonnaroo Music & Arts Festival in Manchester, TN, USA on June 9, 2017. After that interview, I backtracked to Which Stage again to shoot Tove Lo. Her set was one of the most entertaining ones I was able to shoot during the festival! With the sun going down, the stage lighting was much more effective than before. And she was constantly on the move, which made for a fun shoot! I believe every photographer in the pit got a shot like this one, but who doesn’t like a good hair photo? 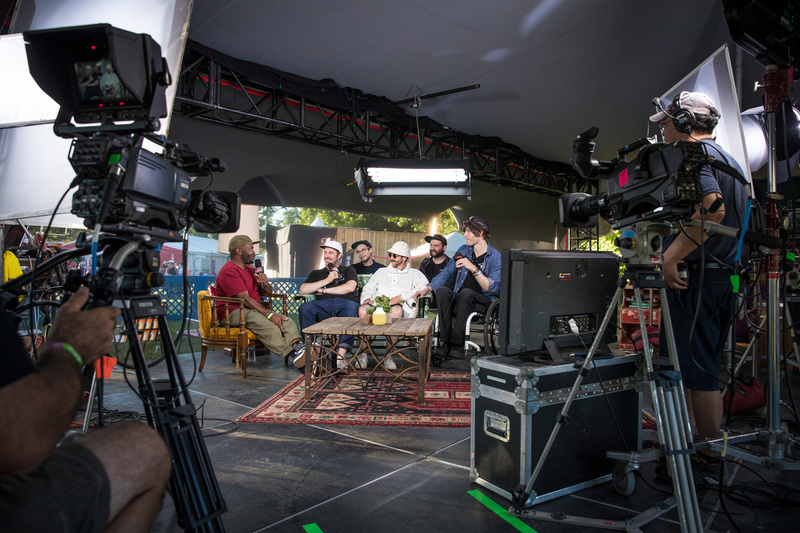 After Tove Lo’s set, I had a little time to go back to the Red Bull trailer once again and download/backup and edit/upload before heading out to That Tent for Preservation Hall Jazz Band’s set. 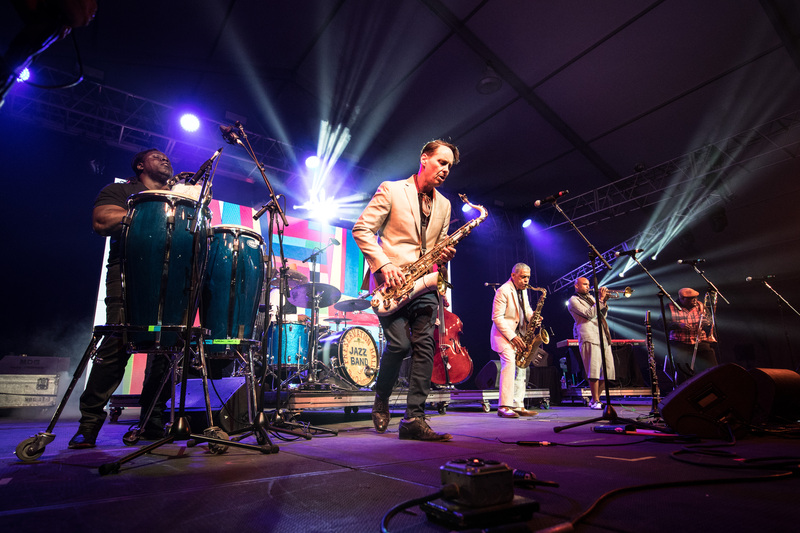 Preservation Hall Jazz Band perform at Bonnaroo Music & Arts Festival in Manchester, TN, USA on June 9, 2017. These guys were my last shoot of the day. Throughout each day, I tried to limit how many shots I took of each performance, but it was a challenge with this one! They were so great and full of energy, emotion, and expression that I didn’t want to take my finger off the shutter. This was my earliest night of the week, wrapping up shooting around 10:0opm before heading back to the trailer one last time to edit and upload. Next up, Day 3 of Bonnaroo!